A collection of my favorite caramel desserts to make for friends, friends or just for yourself on the weekend ahead. If you have been following me for a while, you would know pretty well how much I absolutely love caramel. Simple caramel, condensed milk caramel (or Dulce de Leche), caramel sauce and of course my absolute favorite salted caramel. Drizzled over ice-cream, poured over pancakes, added in desserts or just eaten with a spoon caramel is just so delicious that one can’t help loving it so much. 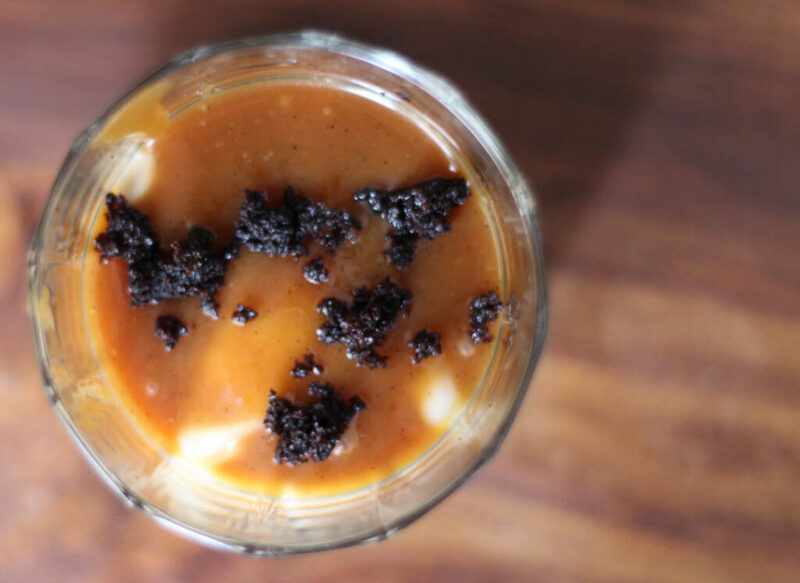 So here’s a post featuring three of my most favorite caramel based desserts on the blog. My absolute favorite brownie recipe is the one by King Arthur Flour, and what is the one thing that can make it better? Of course, a cup of caramel sauce. In this particular recipe, I have used dulce de leche but any other type of caramel sauce (home-made or store-bought) can be substituted instead. Just make to swirl it before baking, and be sure to serve a scoop of ice-cream on top. 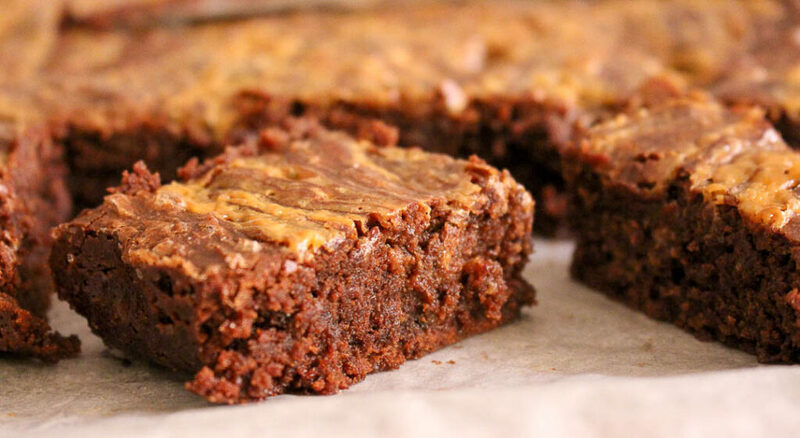 Recipe for caramel chocolate brownies HERE. This is a recipe that takes time to prepare, but once it’s ready it will be the show stopper of the meal! It’s a layered dessert with cookie crumbs on the bottom, a luscious silky smooth caramel custard in the middle, and then my absolute favourite salted caramel sauce on top. Just to finish it up properly, there’s whipped cream, cookie crumbs, and another drizzle of caramel sauce. Make sure to make it in a glass bowl, so all the layers are clearly visible. Though there is a bit of prep involved, the components can be prepared in advance easily. Recipe for salted caramel custard HERE. The pavlova is such an elegant and beautiful dessert to serve to guests, be it a mini-pavlova on a romantic anniversary dinner or large pavlova bursting with berries and a dusting of icing sugar on top. And considering how fancy it looks, it’s actually simple to make. It requires making a crisp meringue for the bottom. Make it a day or two in advance, so less work to do on the day of the party. Make the whipped cream, and then top with seasonal berries or stone fruits, and then of course caramel sauce. Keep changing flavours based on what fruits are in seasons. I have experimented with strawberries, mangoes and peaches so far. 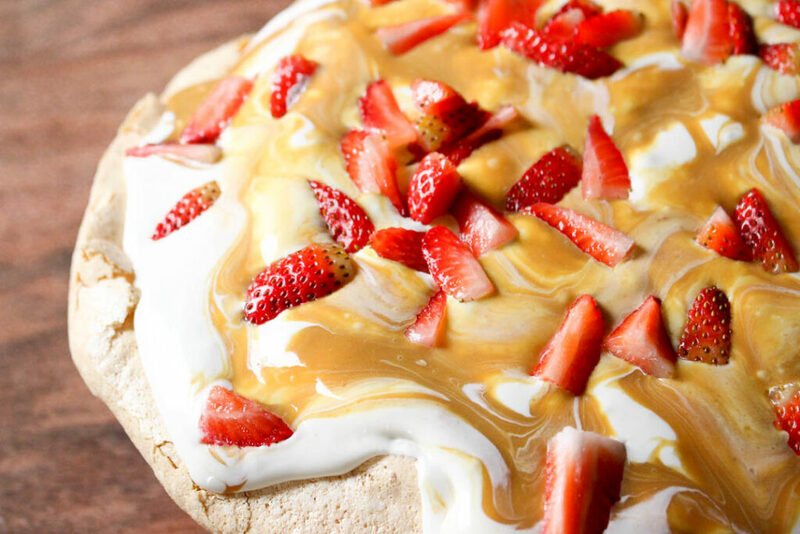 Recipe for salted caramel pavlova HERE. P.s. 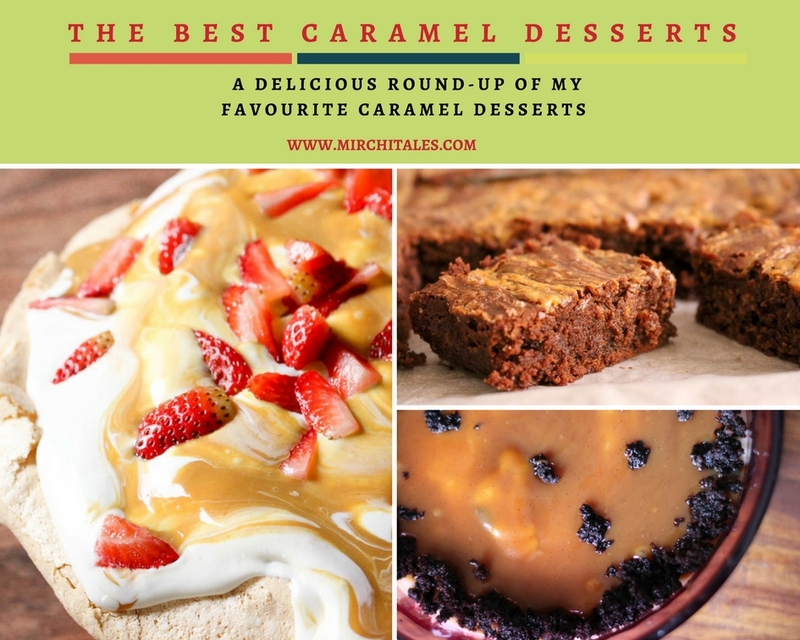 just remember, there’s a pretty good chance (somewhere in the 99.99% vicinity) that in a couple of months that this list will be updated to reflect my top 10 favorite caramel desserts on the blog. Maybe more!